Harvie S is available for master classes, workshops, concerts, bass lessons and seminars at learning institutes. If you are interested please email Harvie S at harvies@harvies.com. 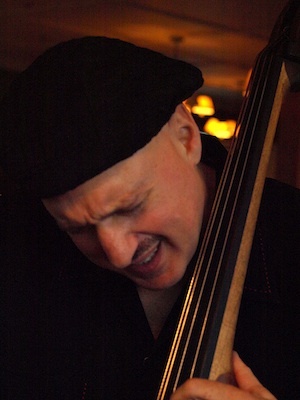 Harvie S has been the bass and ensemble instructor at the Manhattan School of Music since 1984. Many of todays top bassists have studied with him (see list below). 8 Duets from the Know Thy Bass Series is a fun learning tool for intermediate and advanced bassists. You can read more and aquire them on the on the Store page. Harvie just returned from the University of Tennesee where he gave private lessons, master classes in Jazz and Afro-Cuban music, and performed as a soloist with the big Band, Studio orchestra and faculty (read testimonial by bassist and professor Rusty Holloway below). Recently Witchcraft (Harvie S with Kenny Barron) rose to number #1 on the Jazz Week national charts and as of April 24 is still in the top 10. Witchcraft is entering its third month on the national charts. Harvie is also giving private lessons in his home and for those who live far away He has been giving lessons on skype. If you are interested please email him at harvies@harvies.com and set up a lesson. Drew Gress, Todd Coolman, Thomas Morgan, John Benitez, Zack Lober, Steve Kirby, Catherine Popper, Hans Glawischnig, Eddie Khaimovich, Pepe Berns, Matej Hotko, Jennifer Vincent, Marco Panascia, Carlo DeRosa, Sean Smith, Gregory Ryan, Michael Olatuja, Joe Fitzgerald, and Desmond White. Harvie soloed with the Studio Orchestra, the Jazz Band as well as the faculty and made an amazing solo performance….the concert was a great success…critically acclaimed…. Harvie is a legend and is a timely addition to any music program where there are students desiring a career as a professional player.